owner's bodyguard is forced to be his waiter in the shop, although he is clumsy and shy. how i derived that score. because this was a more accurate representation of Antique the manga. 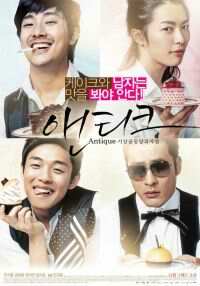 i had watched Antique the dorama, but the gay bits were toned down for mass audience. baker is just 'shy' with girls. duh. here, the representation is more true to the case. even if most of it were made into jokes. after all, this is supposed to be a rom-com of sorts. if you have read/watched any Antique-related materials before.